A letter from George Foster Peabody to Martha Berry in regards to the Pictorial Review. 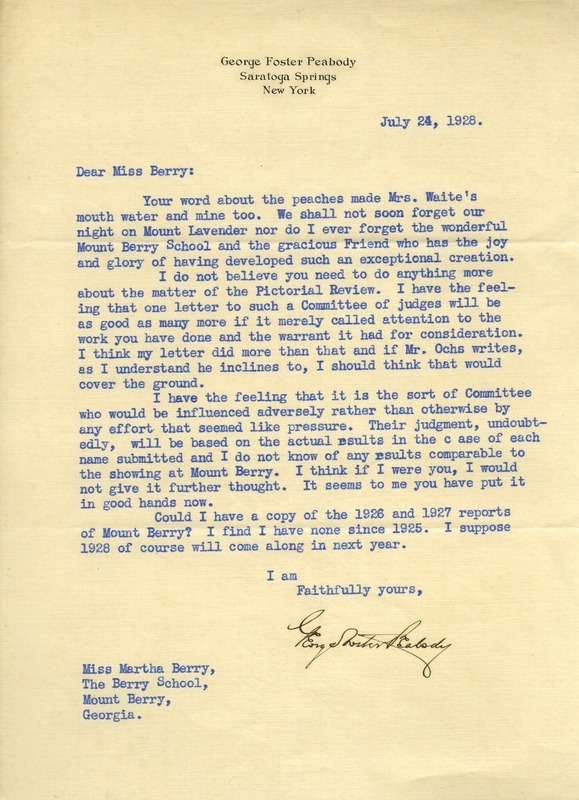 He offers some advice to Martha Berry and asks for copies of the 1926 and 1927 reports of Mount Berry. George Foster Peabody, “Letter to Martha Berry from George Foster Peabody.” Martha Berry Digital Archive. Eds. Schlitz, Stephanie A., Sherre Harrington, Hannah Bailey, et al. Mount Berry: Berry College, 2012. accessed April 20, 2019, https://mbda.berry.edu/items/show/8643.